The big: the look. Right from the get-go, I've disliked the look in the trailers and marketing and it's no different in the film. It's too colorful and clean. The reason I love the first two Mad Max films so much is because they are gritty, dirty and a bit bland-looking (my kind of post-apocalypse). I mean, naturally they had smaller budgets and film stock looked different back then. But there was too much color grading that went on with this new film. Another big issue is the fact that people keep saying that there is very little CG in this film, but this is only partially true. There are a few scenes that are largely CG and I didn't like the look of them at all. And some little bits (like the lizard in the intro) that I just found dumb. The whole film just feels very cleaned-up and digitized. Speaking of the intro, I didn't really get that into the film until about maybe 20 mins in (after the big sandstorm scene). When the film finally took a breath was when it drew me in. And that's another of my big issues: the film is literally one long car chase (as in the entire film). Even Mad Max 2 (1981) had some more exposition in between all the crazy action. I like my action films with some strong character beats in between the big set pieces. The soundtrack is another big one for me: it was typical cliche crap. Wall-to-wall sound with stereotypical HUGE drums and no motifs. Bored me. There's also a bunch of really stupid scenes featuring a guitarist with a fire-spewing guitar/bass on a vehicle with a huge wall of speakers that I found annoying and unnecessary (although this might be considered a "medium" issue). The small: Max. I honestly didn't think Tom Hardy brought much to the role. He just felt like he was being Tom Hardy. He has played some great diverse roles in films like Bronson (2008) (his best role yet), Lawless (2012) (underrated film), The Drop (2014) and Locke (2013) but here he just feels like a variation of Bane from The Dark Knight Rises (2012). In particular, I didn't like how much he grunted and his mannerisms. 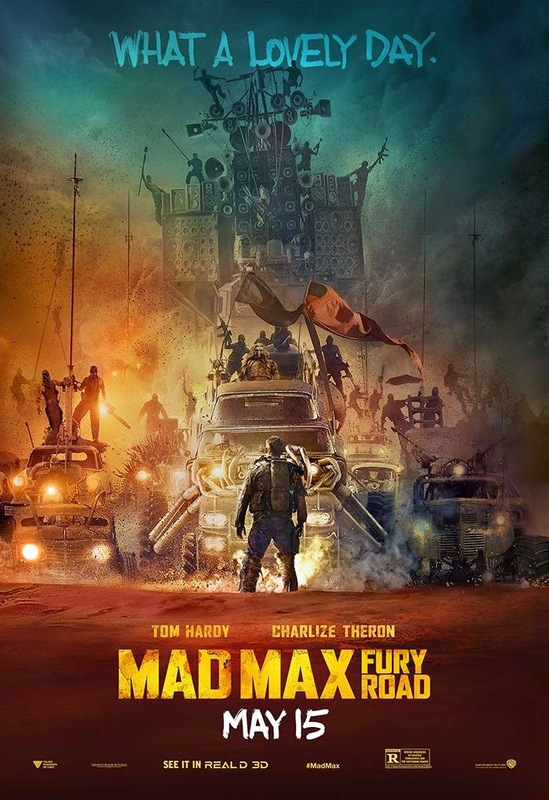 It just didn't truly feel like Mad Max to me. Speaking of Max, there was a really weak plot point throughout where Max sees dead children (that he could have saved, I guess...?). It's never fleshed out (thankfully, it was annoying) and it's handled clumsily. On that note, I wish that all the characters were more fleshed out, as I feel that out of all the Max films this one had the greatest opportunity to do so. I can't really complain about this, as character development has never been a strong part of the series (though I'd argue that the first film gave us a nice glimpse into Max's life before he became "The Road Warrior"). Another little issue was the fact that all the characters had great names like Rictus Erectus, Toast The Knowing, The Splendid Angharad, The Dag, Cheedo The Fragile (and many more) that I don't think were ever even uttered in the film (I had to look on IMDb). Also, there was no memorable dialogue or anything worth quoting in Fury Road (and frankly pretty weak dialogue throughout). Mad Max (1979) has several choice lines, mostly uttered but Hugh Keays-Byrne, and Mad Max 2 has a few as well. Speaking of Keays-Byrne, he has a great look in FR but it felt a bit like stunt casting. He basically sat behind a monster truck and looked menacing with a weird mask. In the first film, his Toecutter (a much more memorable villain) spat verse with equal parts eloquence and theatricality (on par with Rutger Hauer's Roy Batty in Blade Runner (1982)). Mad Max 2's Lord Humungus and Wez stand out more in my mind than any of the villains/henchmen in FR as well. Again, I had fun. I'd watch it again. But I don't see this going down as a classic like the first two Max films.